In-short: pizzas as good as they get. : To make the pizzas at Stella Barra unique, and to distinguish the restaurant from others serving the popular Italian dish, chef Jeff Mahin put a lot of work into creating the dough. After over 30 trials, he came up with a recipe that will keep the place busy for a long time. It is thin in the middle, thick and crunchy on the outside, and very tasty. Considering it involves a three-day process, the pies are very reasonably priced, from $14.95 for the margherita to $17.95 for the prosciutto and farm egg pizza. 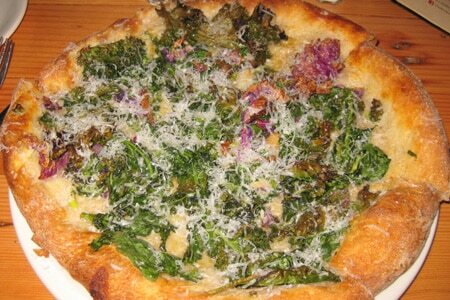 The white pizza (no tomato) with crispy purple kale, pecorino and roasted garlic is a must. You can always pick some "add-ons" such as wild arugula if you want to personalize your pizza. Since Mahin trained at The Fat Duck, Nobu and Arzak in Spain, he can also cook "regular" dishes, so make sure to try the fresh local burrata before commencing the pizza feast. End with the salted caramel pot de crème. For drinks, beers outnumber wines, and there are a few specialty cocktails. The ambience is casual and can get loud, as the room is quite large, with a substantial bar occupying the center of the room, and an open kitchen. Welcome to pizza heaven! 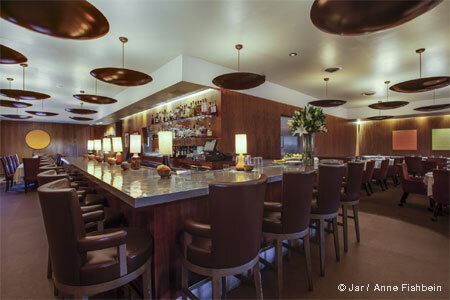 Also located at 6372 W. Sunset Blvd., Los Angeles, 323-301-4001.